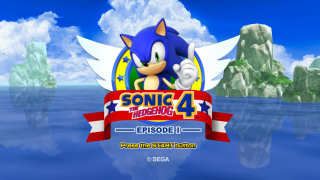 Sonic the Hedgehog 4 Episode I (Sony QA Network prototype) is an early version of Sonic the Hedgehog 4 Episode I which was released on the Sony's QA Network before the release of the game. It was not released to the general public but info about it can be found online. It is largely the same as the Xbox Live and WiiWare prototypes. provided by Techokami on February 13th, 2011 on the Sonic Retro forums. Further information was released later in the thread by sonic4dude. Level select screen uses pictures of levels instead of a landscape. Levels use the loading screen briefly, instead of animating the title card screen. No way to progress to the next act without using the Level Select screen. Casino Street Zone Act 2 has a completely different song. There is no sound effect played when locking onto a homing attack target. Act 2 contains the 100,000 Point Challenge, a short score attack level in a pinball-style area. Removed in the console version. Act 2 has a different music track which was appropriate for the score attack level. Replaced in the final version. Act 2 contains the controversial Mine Cart level where Sonic remained in the cart throughout the level, which controlled poorly. It is controlled using the PlayStation 3's Sixaxis motion control function. The Mine Cart section is reduced greatly and plays automatically in the final version. Unlike the final build, the Special Stage is played by using Sixaxis motion control controls. In the final build, Sixaxis motion control is merely optional as the default controls use the analog stick instead. This page was last edited on 22 August 2018, at 11:46.